A Motorised Invalid Tricycle sent in by © Jacqueline Pratt, whose grandparents are the ones in the photo. John (Jack) Wardropper Bambrough and wife Maggie taken in early the 1930's at 3 Rosedale Street, Sunderland. 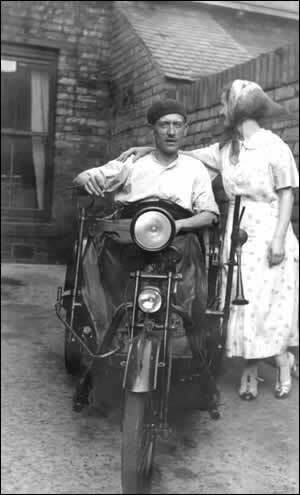 The trike was provided by compensation money from the Seamen's Mission after an accident on board ship, when Jack fell through the hold. I believe this is an Argson De Luxe, as produced by the Stanley Engineering Company of Egham, Surrey, between 1926 & 1954. It would be powered by a three-speed 147cc Villiers Mk VIIIC single-cylinder two-stroke engine, mounted behind the seat. The Argson was but one of a multitude of different makes & models of invalid three-wheeler made throughout the 20th century. A similar Argson De Luxe was driven alone over the Alps in 1947. Thanks Stuart for the info on this great little machine. I remember these from when I was a young lad. I now live in Canada, but some 30 years ago, I acquired such a machine from a Smith Family in Stockton-On-Tees, Cleveland UK. The vehicle was parked outside the Funeral Home of Richard Smith. They had been Undertakers for generations, and as the vehicle was neglected, I asked if it was for sale. "Please take it," was the reply. So I took it home to my parents house and intended to eventually restore and possibly have a drive in it. I personally have a keen interest in Villiers powered vehicles. The Argson Tricycle that I acquired had a 147cc Villiers motor, 3 speed and if I remember correctly, it had the Cylinder and Head all cast as one. There were pedals and also levers that you could wind as a means of alternative power. It was quite universal as regards its three means of propulsion. The Registration Number was (7 THN). I believe that was the Darlington or Durham designation for vehicle licensing. I'm sorry to announce that my mother gave it to the Scrap man and that's were it went unless someone rescued it. If it's still running around or in the process of restoration, I'd love to hear about it. I have just seen the picture of an Argson invalid trike on your website and you mention in the article that a similar one was driven over the Alps in 1947 by Denny Denley. This man died last year but his trike has been done up by the Army and is at this moment attempting to repeat the challenge. The charity for disabled motorists Disabled Motoring UK own the trike and are blogging the trip on their web site - The Alps Challenge 2011 Thought you may find it worthy of a look.